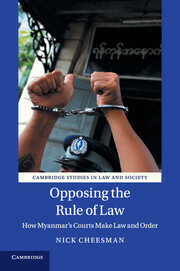 This interdisciplinary volume offers a timely reflection on law, development and economics through empirical and comparative perspectives on contemporary Myanmar. 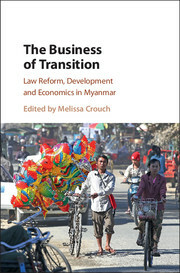 The book explores the business that takes place in times of major political change through law and development initiatives and foreign investment. The expert contributors to this volume identify the ways in which law reform creates new markets, embodies hopes of social transformation and is animated by economic gain. This book is an invitation to think carefully and critically about the intersection between law, development and economics in times of political transition. The chapters speak to a range of common issues - land rights, access to finance, economic development, the role of law including its potential and its limits, and the intersection between local actors, globalised ideas and the international community. This interdisciplinary book is for students, scholars and practitioners of law and development, Asian studies, political science and international relations. 10. The politics of aid in Myanmar Tim Frewer.